I do Facebook, mostly for extended family contact. But sometimes I see things that get me riled, because of how truly ignorant they are. Now in this case, I'm not talking "ignorant" as in a euphemism for some sort of bigotry or other name-calling from a "progressive". I'm talking truly, utterly ignorant, as in the person in question doesn't really know what they're saying or asking for. ...continue reading "Know What You’re Asking For, Before You Get It"
...continue reading "God Emperor of Soon – Installment 9"
Installments 1, 2, 3, 4, 5, 6 and 7. That's what most of the world had become, and in the middle of it was where Hillary the Ghola found herself at that moment, sweating and suffering. She turned to the right at the giant obelisk and trekked what seemed like dozens of miles, per the directions given to her by Jenner. Several millennia ago, Hillary Prima knew the tower as the Washington Monument. Since then, though, it had been purchased by an entertainment megacorporation during the Entertainment Wars and had "The Huffington Post" carved upon its stone sides. ...continue reading "God Emperor of Soon – Installment 8"
Installments 1, 2, 3, 4, 5, and 6 . What I'm doing is going to do some good. And we're going to change the world. - Bruce Jenner, before his first Transformation. She beheld the smoothly inhuman face of Jenner extremely close to hers when she came out of her hysterical stupor. "What happened?" Suddenly her memories of the last few minutes came back, jarring her to full consciousness. "Oh my God... What a monster... He... my daughter..." She felt faint again. "Whoa whoa whoa. Let's not have a repeat of that, okay? But now you see." She hesitated, then the anger boiled up. "Yes. I see now why... why He must... HE MUST DIE!" Jenner put a finger to his lips and shushed her. "Quiet, now. You've got to be a little more subtle if you want to be successful." 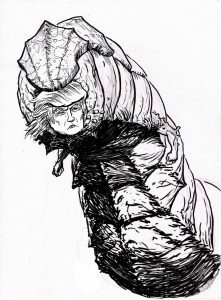 ...continue reading "God Emperor of Soon – Installment 7"